It all began with a massive cloud of gas and dust collapsing under the force of gravity, flattening and spinning faster and faster as it got smaller. A star, the Sun, formed at the center and the gas and dust revolving in a disk around the star coalesced into objects of various sizes: the familiar eight (sorry!) planets, their moons, the minor planets and asteroids, and other smaller chunks of rock and/or ice. While the largest objects are nearly spherical and move smoothly in their relatively circular orbits, comets are the unruly hooligans of the Solar System. These irregular chunks of rock and ice formed in the farthest reaches of the Solar System. Close encounters with more massive objects flung them into highly eccentric — very non-circular — orbits, carrying them extremely close to the Sun. Notice how oblong the orbit of Halley’s comet is, as well as how close it approaches the Sun. As a comet nears the Sun, heat from the Sun causes frozen gases to vaporize, releasing dust and debris in the process. The gases, which we see reflecting light from the Sun, surround the comet and stretch out in a tail due to the Sun’s radiation pressure and solar wind; the dust and debris remain behind in the comet’s orbital path. This rocky debris left by the comet is just one source of meteoroids — called meteors when they hit the Earth’s atmosphere — but it offers the most eye-catching display for us here on Earth. 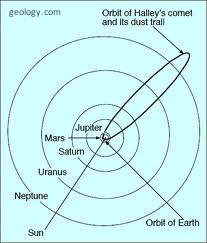 If the orbit of a comet crosses Earth’s orbit, the Earth will travel through the stream of rocky debris left by the comet. Thus, the Perseid meteor shower occurs when the Earth passes through the debris trail of the comet Swift-Tuttle just as the Orionid meteor shower, occurring in late October, is due to debris from comet Halley. And the name of a meteor shower? We have to be good observers and notice that all the meteors in a shower come from the same point in the sky, the radiant point, which lies in a region, or constellation, of the sky. So, the Perseid meteors seem to come from the constellation Perseus, and the Orionids from the constellation Orion. When meteoroids hit the Earth’s upper atmosphere, molecules in the atmosphere and those stripped off the surface of the meteor become ionized — they lose electrons. When atoms recapture the electrons, light is emitted. Aside from a pretty show, the color of this ionization trail gives us clues to the meteor’s composition; most meteors are yellow or green, meaning they contain a lot of iron or copper. But scientists often want to know specifics: how much iron or copper is in each meteor? Practically all meteors disintegrate before they reach the lower atmosphere, so it is a challenge to have a meteor in hand. However, some meteors do hit the ground — they are called meteorites — and, if recovered, offer us a glimpse of the very origins of the Solar System! As the meteorite speeds through the atmosphere, its outer layers melt, but the interior remains as it was when the meteoroid formed. Most recovered meteorites contain a lot of iron and nickel, which were used by early civilizations to make tools. 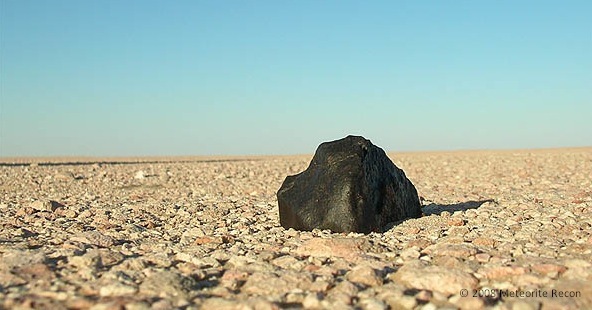 Far more common are stony meteorites, which look like… well… stones. Because of this, they are difficult to identify. But, if you find one, you will most likely be holding a chunk of a primitive asteroid! The asteroid probably collided with another hunk of interplanetary rock, forming a meteoroid that went hurtling through the Solar System, through the Earth’s atmosphere, and, after some years, wound up in your hand! What’s more, that meteorite can give us some very useful information. For example, when it formed, it contained two isotopes of strontium: 86Sr and 87Sr, which has one extra neutron. Over a characteristic length of time, that extra neutron turned into a proton, creating a different element, rubidium (87Rb). If we compare the ratio 87Sr/86Sr to 87Rb/86Sr, we get 4.6×109 years. Sound familiar? Not only is this the age of the meteorite, but since meteorites are among the oldest objects in the Solar System, it also gives the age of the Solar System! If you missed the Perseids or you simply weren’t aware of it, keep looking up. Your next chance is just a couple of months away. The Orionids occur in late October, and the Leonids show up in mid-November. Here’s to clear skies! You are currently browsing the Daily Science blog archives for August, 2011.